Kiwi Mojo can perform a number of ceremonies for, or on behalf of, anyone. These range from simple blessing ceremonies all the way through to mounting an entire fet on behalf. Some of the more common ceremonies we offer for others are listed below. Kiwi Mojo can perform blessing services on almost anything. Blessings always be performed in person, although an object to be blessed can be sent via post. 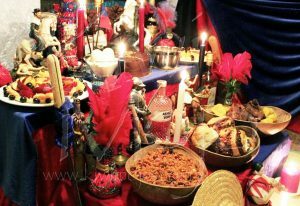 The ceremony is performed by an Houngan Assogwe of Haitian Vodou, who will use the heat given by the lwa to powerfully bless the item. Kiwi Mojo can bless a place of residence, cleansing it of any negativity and bringing good luck to the household. This is often done in conjunction with the placing of house gads. The blessing of a home is best done prior to moving in to a new house, when the building is empty. However, we can and do perform cleansing and blessings on inhabited buildings. The cleansing part of the ceremony removes any negativity from the home, and the blessing brings good luck and happiness to the residents. If gads are placed, protection is added as well. Cleansing and blessing a home is very traditional, and creates the best possible living environment for those who reside there. A place of business can be blessed, to attract good customers and keep away the bad ones. If business is bad cleansing can be involved, and if protection is required for the business gads can be placed at the same time. Blessing a business brings prosperity and happiness, and contributes to the creation of a good working environment. Blessings can be performed when a business opens or moves to a new premises, allowing for a thorough cleansing of the property and bringing good luck to the business before it even moves in. Blessing a premises can be done at any time, however. We can also baptise altars or items to be given to the spirits. 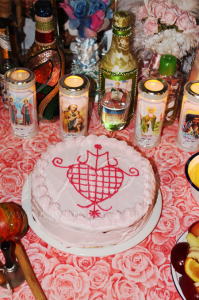 This is done according to tradition, and a baptism should be performed on an altar every time one is created. 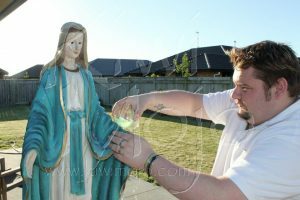 A baptism is a simple ceremony, but is powerful as it lets the lwa know that a certain item or space belongs to them. If you are interested in arranging a blessing for an item or location, or would like an altar baptised, please contact info@kiwimojo.com to discuss how we can arrange this for you. Aksyon de Gras, called an Action of Grace in English, is a ceremonial offering given as an act of thanks or as a request to a Lwa. When making a promise to the Lwa in exchange for assistance in an area of your life, the Lwa can be offered an Aksyon de Gras in thanks – once they have fulfilled the promise. Alternately, the Aksyon de Gras can be offered to a Lwa or group of Lwa in supplication, asking for work to be done or for a request to be granted. Aksyon de Gras can also be a simple act of thanks for a momentous event, offered at the birth of a child, at a wedding, or at any other significant life event. Regardless of which Spirit is being offered the Aksyon de Gras, this ceremony is always beautiful and always moving. It is an act of Grace, inviting the continued blessings of God and the Lwa. Aksyon de Gras at Hounfo Racine Deesse Dereyale are performed by Houngan Liam and Houngan Alistair, with other members of the house assisting if necessary. La Priye Ginen and songs for the lwa are sung, the spirits are fed, and an illuminasyon is made. The ceremony is always offered on a Saturday evening. If you would like an Aksyon de Grace performed at Hounfo Racine Deesse Dereyale, please contact us at info@kiwimojo.com. If you are able to travel to Palmerston North, you are more than welcome to attend the ceremony. A fet is a large party for the lwa, held for a particular spirit or group of spirits on their fet day. An altar is built for the fet, all the prayers and songs are sung, and the lwa are called down in possession to come and enjoy the party. There is food and drink for all the spirits, and all the lwa who need to be fed will be. Mounting a fet is a huge commitment, and requires many hands and a lot of work. It is normally the duty of a society to hold fet throughout the year, as a part of their service to the lwa. However, a person or group of people may wish to hire a society to mount a fet on their behalf. This can be done in thanksgiving for a major event, to fulfil a bargain with a spirit, or because the person is unable to attend or mount a fet of their own. Fet held at Hounfo Racine Deesse Dereyale involve gathering as many members of the house as possible, to cook and clean and decorate to prepare for the fet. This begins several days in advance. 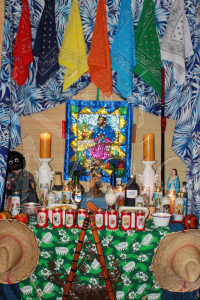 On the night of the fet, the members of the hounfo and any guests will gather to sing La Priye Ginen, to salute and call the spirits, to welcome and receive the blessings of any lwa who come in possession, and to sing and dance their prayers to the lwa. If you would like have Hounfo Racine Deesse Dereyale mount a fet on your behalf, please contact us at info@kiwimojo.com. Please bear in mind that we will need at least one month’s notice to prepare. If you are able to travel to Palmerston North, you are more than welcome to attend the fet in person. Mange Lwa literally means ‘feeding the lwa’. It is similar to an Aksyon de Grace in that prayers and songs are sung for the lwa, but is a hotter ceremony designed to strengthen the lwa. Instead of the cool foods and water of an Aksyon de Grace, a Mange Lwa heats the spirits and makes them strong and ready to work. The spirits are given their favourite food and drink, and are called down to enjoy them. A Mange Lwa ceremony can be offered in thanks when the lwa have fulfilled a promise, or can be offered to the lwa to strengthen them to carry out a major request. It can also be offered on the Fet day of a spirit, if no major fet is being held. Mange Lwa at Hounfo Racine Deesse Dereyale are performed by Houngan Liam and Houngan Alistair, with other members of the house assisting if necessary. La Priye Ginen and songs for the lwa are sung, and the spirits are fed. The ceremony is performed on an appropriate day of the week for the lwa being fed, but is likely to be a Saturday due to the amount of cooking involved. If you would like to have your lwa fed at Hounfo Racine Deesse Dereyale, please contact us at info@kiwimojo.com. If you are able to travel to Palmerston North, you are more than welcome to attend the ceremony. In Haiti it is very common for Vodouwizan, both those that are initiated and those that are not initiated, to marry one or more of the lwa. Outside of Haiti, this is one of the most difficult ceremonies for people to understand. The Maryaj Lwa is a ceremony for a Vodouwizan who is truly dedicated to the Spirits. This ceremony is a marriage – with all the rights and responsibilities that marriage entails. This union brings the many blessings of the lwa to the human spouse; including abundance, protection, health, luck, and all the other blessings that the spirits bring. The marriage is an extremely personal experience and a lifetime commitment between both the human spouse and the lwa. It is important to note that for a Maryaj Lwa to occur, the lwa must propose. The lwa can do this in dreams, but a dream proposal must always be confirmed with a reading from an houngan or mambo. It is more common for a lwa to propose in person, or through a reading. When a lwa does propose in person, it is always obvious. An acceptance of a proposal of Maryaj Lwa does not need to be accepted straight away, and nor should it be. It is advisable to discuss the process, the commitments, and the benefits with an houngan or mambo before proceeding to accept the proposal and move ahead with the wedding. The Maryaj Lwa is just like any other wedding ceremony. There is a great deal of planning which goes into the ceremony, and preparation for the human spouse as well. A marriage contract is prepared and signed both by the human spouse and the lwa, in which the lwa promises their care and protection. The human spouse has obligations as well. Not only will they wear their wedding ring (which is the outward symbol of the marriage), but they will also remain celibate on the spirit’s day for the rest of their lives. There is no divorce, so this union is forever; but comes with so many blessings that they cannot be counted. Aside from the wedding rings, the human spouse will also have to provide wedding clothes and champagne to celebrate the wedding. Witnesses must be present, and family and friends may come to witness the wedding rite. Like any other wedding, after the religious portion of the ceremony, there is a party – complete with wedding cake! For more information about Maryaj Lwa, please contact us at info@kiwimojo.com.